In his second inaugural address President Abraham Lincoln uses a great deal of different rhetorical strategies in order to get his point across. In this essay I will be discussing some of the used strategies. Lincoln began his address in a serious tone. In the highly poignant environment of wartime Washington, it is as if he wanted to lower anticipations. At the beginning of his speech, he sounded more like a bystander than the main player. 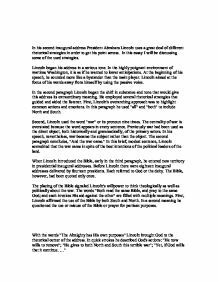 Lincoln aimed at the focus of his words away from himself by using the passive voice. ...read more. The centrality of war is overstated because the word appears in every sentence. Previously war had been used as the direct object, both historically and grammatically, of the primary actors. In his speech, nevertheless, war became the subject rather than the object. The second paragraph concludes, "And the war came." In this brief, modest sentence, Lincoln accredited that the war came in spite of the best intentions of the political leaders of the land. When Lincoln introduced the Bible, early in the third paragraph, he entered new territory in presidential inaugural addresses. ...read more. In a second meaning he questioned the use or misuse of the Bible or prayer for partisan purposes. With the words "The Almighty has His own purposes" Lincoln brought God to the rhetorical center of the address. In quick strokes he described God's actions: "He now wills to remove"; "He gives to both North and South this terrible war"; "Yet, if God wills that it continue. 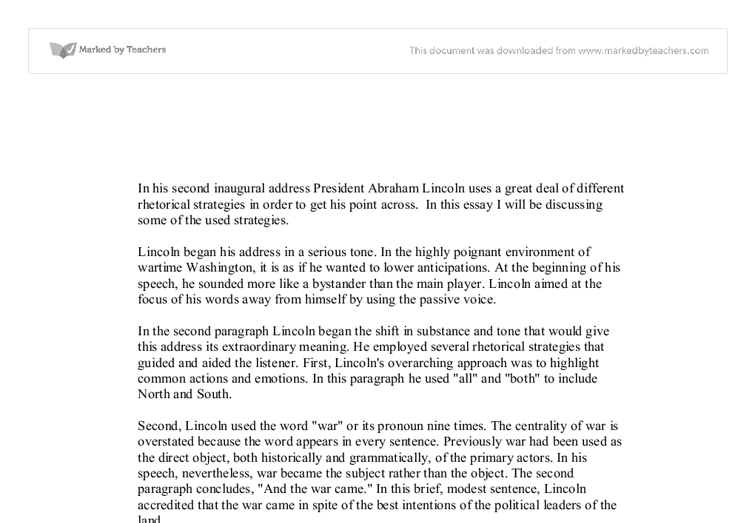 ..." Abraham Lincoln was a great user of rhetorical strategies in an oral form. Lincoln was able to get his audience attention and keep it with his unique way with words. In this essay I discussed how he used these strategies, which made this speech one of the greatest inaugural address of all time. ...read more. As for the music industry, specifically the bands mentioned in Sarah Sands' article, often speak out against teens self-harming, in particular, My Chemical Romance. Lead singer, Gerard Way was quoted as saying; "we do not promote self-harm, but we encourage kids to find other ways to get out their frustrations..."
They attempt to place the readers in a situation that makes them feel similar to the authors, when they were in the military. Heller and Vonnegut's literary style is to create tension in the mind of the reader by shifting the narrative around from character to character and to and from different time periods. In the quote, there is a hyperbole when the little boy says: "I really can't go to school". This hyperbole was done to make the fact that the children can't go to school a big deal. In this quote, there is also a repetition.